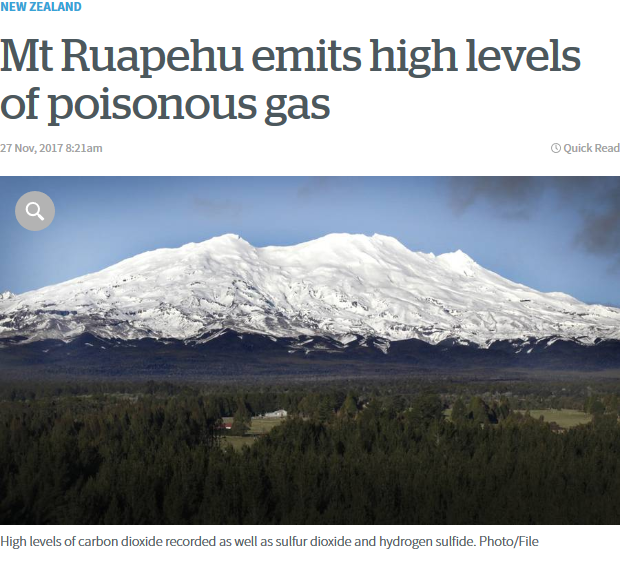 In a shameless piece of execrable disinformation today, the NZ Herald tries to tell us that carbon dioxide is a poisonous gas. Poisonous? We readily discover that CO2 is colourless and odourless, a trace constituent of air (less than argon), and is exhaled in human breath. Carbon dioxide is non-poisonous at levels below about 30,000 ppmv, when symptoms appear of reduced acuity of hearing and increasing blood pressure and pulse—after more than 30 minutes. An encounter with such enormous levels of CO2 can be caused only by some industrial or medical catastrophe. In ordinary daily life it’s inconceivable. Carbon dioxide is essential for life, ubiquitous and entirely benign. In gathering news for us, Murray Kirkness, you really ought not distort reality. Lake Nyos degassing is the only example of volcanic CO2 poisoning that I know about. Yes, that was a terrible tragedy. I’ve been worrying about the Herald journalists and the TV One folk. There’s something going wrong with their cognitive skills. But I reckon I’ve cracked the problem….. they’re being poisoned with their own exhalations.